Why should you now do No Can Do in Barcelona? Nou Can Codina is one of my favourite bars for a beer and a bite. It’s a favourite with the family too. We have a pet name for the place — No Can Do. 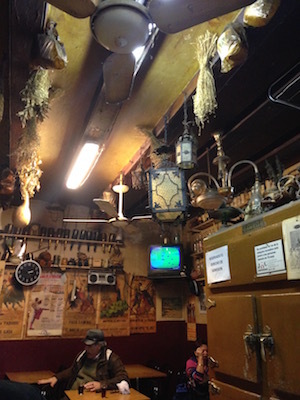 Not so very long ago Can Codina, one of the oldest surviving bars in Gràcia, was a humble, everyday sort of place, serving up run-of-the-mill cheap snacks and meals. It was ok for an occasional coffee or plato combinado when out doing errands. It was a dreary but honest neighbourhood bar which closed its doors roundabout 9pm every night except Sundays, when it wasn’t open at all. After a scrub-up, a splash of paint, new lighting scheme, amazing menu, and an injection of energy and imagination the place is buzzing most evenings until 11 — and gone midnight on Saturdays. Gentrified? No, not at all…the food and drink offered here is sensibly priced and well within the range of us ordinary folk. Because it is now a popular joint plan to spend 10 or 15 minutes at the bar waiting for a table on a Friday or Saturday night. Simple everyday treats are transformed into tasty, memorable delights. The patates braves (3,90€) here are very good indeed — among the very best braves in the city. And so too are the croquetas and morcilla (black pudding/blood sausage). Whoever they have working the kitchen they need to tie down with a payrise and a golden handcuffs agreement — otherwise he or she is going to walk, and stamp their goodness on a rival establishment. The croquetas here are fantastic — full of flavour — probably among the best in the city, and very reasonably priced at 1€. The standard options are: cocido (meat, potato and chickpea mash), merluza y gambes (hake and prawn/shrimp) and bolets (mushroom). However, check out the specials board as they often offer two or three special croquetas such as sípia (cuttlefish) and a wonderfully tasty apple with goat cheese (poma i formatge de cabra) for 1,40€. The morcilla here is also well worth trying. Moist and packed with flavour — served with a smear of parsley and garlic oil and lightly toasted bread (2,60€). 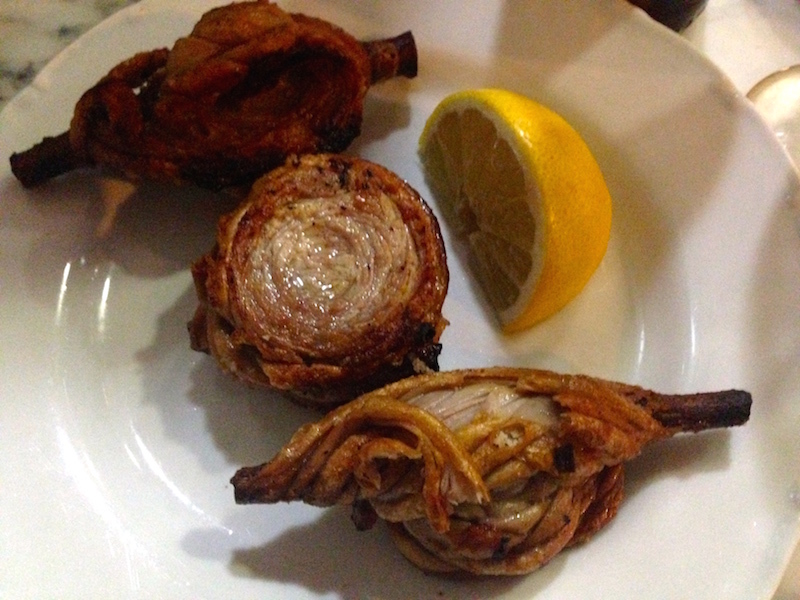 One of my favourite tapas dishes is Zarajo, braided sheep’s intestines wrapped around a vine branch and usually broiled, though often grilled, sometimes smoked, served hot with a wedge of lemon. 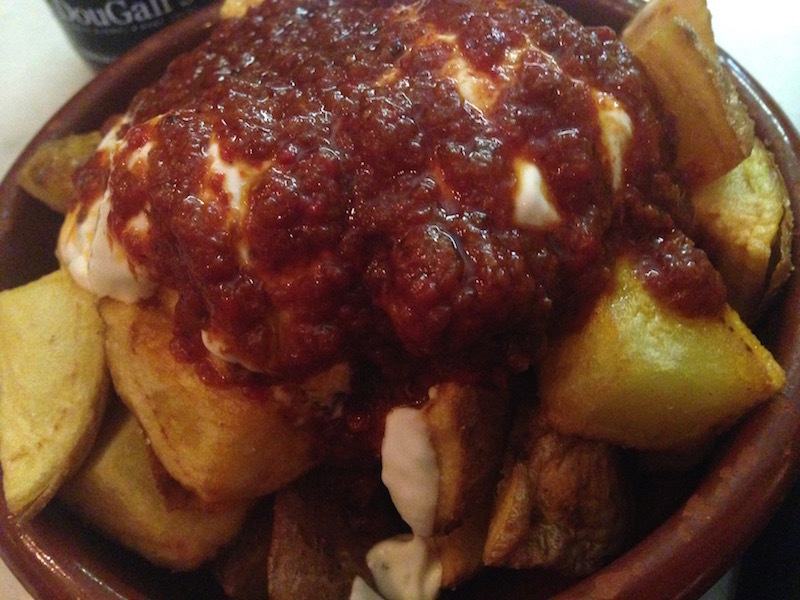 Zarajo is not common in Barcelona — the dish originated in Cuenca, the city in Castilla–La Mancha. Zarajo go well with a beer, though I recommend you try them with a glass of rough, strong red wine. Morryssom’s — one of my favourite lunch restaurants and tapas places — 3,40€. Bar L’Amistat, Carrer de Torrijos, 13, in Gràcia — 3,90€. IMPORTANT: L’Amistat is now CLOSED. It’s now another would-be trendy bar — and they do not now serve zarajo. Zarajo as served at Bar l’Amistat, Gràcia. So, what is a bodega? 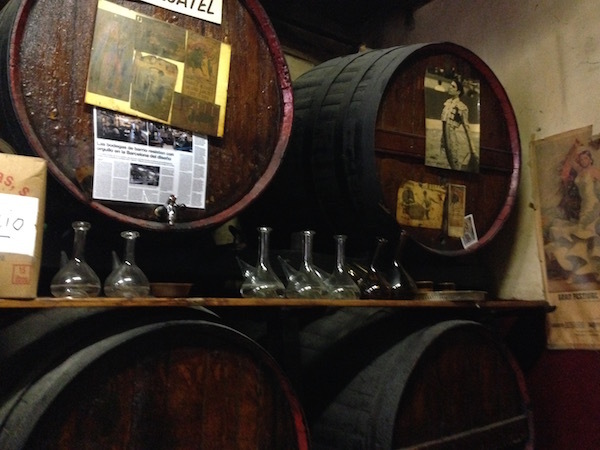 At its most simple a bodega is where us locals buy everyday wines from the barrel, and occasional wines, cavas and spirits by the bottle or case. In short, an off-licence, or liquor store, where quality wines are considerably cheaper than in supermarkets, and where you can sample the wines before you buy. What is a bar bodega? A bar bodega is a bodega with a bar, serving wines, beers and spirits — and, often, little bites. 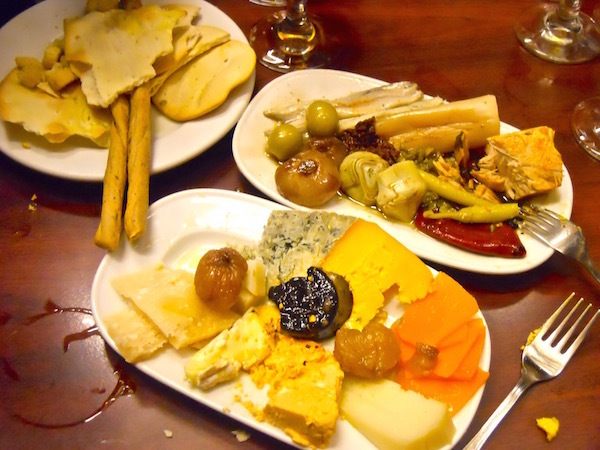 As well as serving quality wines at affordable prices you’ll find some bodegas serve the best little plates and tapas in the city — anything from simple olives, cured meats and cheeses, through elaborate montaditos, to epicurean delights such as angulas (elvers) and Russian royal king crab. What is a bar bodega-restaurante? 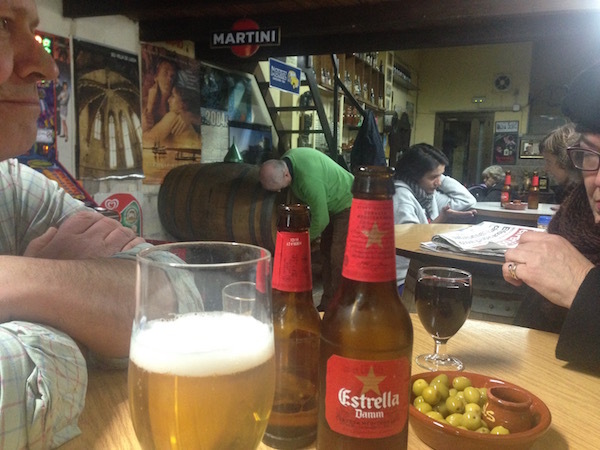 A bar bodega restaurante is a bodega with a bar which also serves meals, an example is Bar Bodega Restaurant Gelida. Tapas at Quimet i Quimet. Not so long back every barrio had maybe eight or more bodegas, where neighbours would meet for gossip over a vermut or a beer as they bought their family ration of booze. As incomes rose and tastes changed, and supermarkets moved in, bodegas fell out of favour or morphed into wine stores. Bar Bodega Cal Pep in Gràcia. And now — with owners cashing up and retiring — young savvy owners are taking their place, and with customers looking to save money — bodegas are back. And now, in place of the old jug and bottle shops, two distinct types of revamped bodegas are emerging — those positioned to appeal to a more affluent set — offering imported beers and premium brand spirits, where the ambience is more like a wine bar; and those which have retained the look, feel and smells of traditional bodegas which, with the addition of craft beers and exquisite snacks, appeal to a younger, more casual set. Bar Bodega Quimet in Vila de Gràcia. Bar Bodega Montse in the Raval. Bar Bodega del Poblet very near the Sagrada Familia. 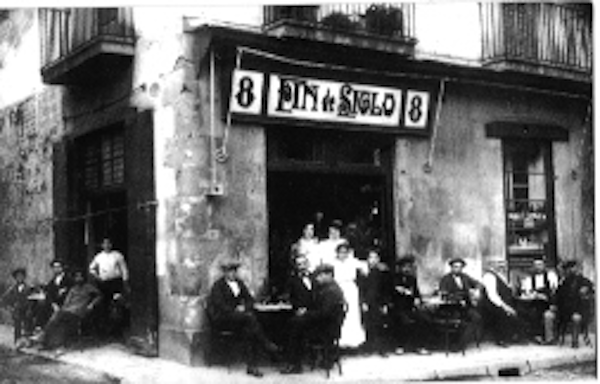 Bar Bodega E. Marin in Vila de Gràcia. Bar Bodega Quimet i Quimet in Poble Sec. Espardenyes are sea slugs, sometimes referred to as sea cucumbers, found only on the Catalan coast. Similar creatures can also be found in the sea around the Balearics and off the coast of Cádiz. They are highly prized (and highly priced) delicacies. You may see them when visiting fish stalls in the Boqueria market, though I only know of one stall which sells them. They’ll cost between 120€ and 150€ per kilo. Finding them in restaurants and bars is a bit trickier. Why eat slugs and flowers at Paco Meralgo in Barcelona? Because they are good and tasty, and it’s fun. Slugs and flowers? Why not? Protein and fibre like you’ve never tasted before. © 2017 Bill Sinclair. All rights reserved. Legal notices.